Farmland, open stretches of meadow, ancient trees standing sentry, the ocean’s horizon… these are calming forces that draw me in. As a child, I was fortunate to live on a former dairy farm in Massachusetts. It was a gem within a small city, holding a tremendous diversity of landscape including fields, forests, hills, raspberry hedges, stone walls and a fascinating cast of trees. Recollections of these spaces continue to influence the land in my mind’s eye. Wind, sound and scent are inextricable from memories past and present. In particular, the wind is a seduction as it floats through an open window or weaves among the leaves on the trees. I’m mesmerized by these elements and how nature’s subtleties merge to create an indelible sense of place. Through my art and recent explorations into writing, I seek to capture the essence of nature’s energy and stillness. 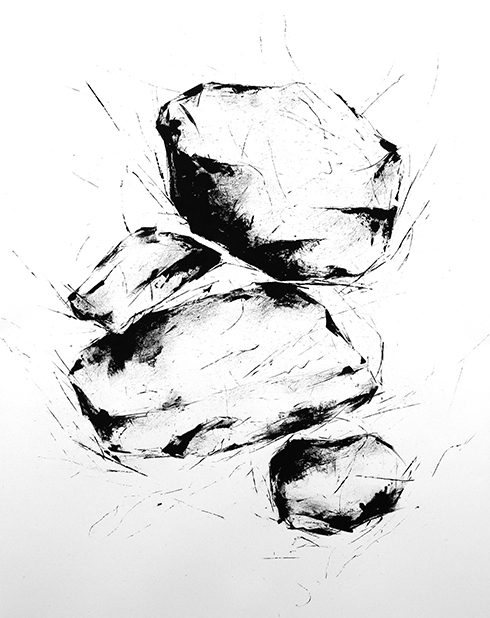 In a new series of drawings, rocks are taken out of the context of their stone walls. Freed of their weight and the structure that holds them, their dormant energy is released. The rocks dance about in the breeze, like thoughts freed from all that might weigh them down.